Raina has a Ph.D. in Psychology from MLS University, Udaipur. She worked as a research associate at IIM Udaipur and was a visiting scholar at IIM Bangalore. She was a visiting doctoral student at the Center for Positive Organizations, University of Michigan for winter, 2017. She nominated and led two award winning Positive Business Project teams – UAE Exchange and F5 Escapes. 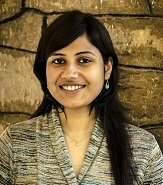 Before joining IIM Indore, she worked at FLAME University, Pune as an assistant professor of psychology. Her doctoral research focuses on practices, enablers and impact of a positive business initiative implemented at a Middle Eastern financial services firm. Specifically, examining roles of psychological capital, social connections, and job engagement in positive change. Previously, she did her undergraduate study in Business Management and Masters in Psychology (organizational) at MLS University, Udaipur. Chhajer R., Rose E. L. & Joseph, T. Examining the mediating roles of positive affect and work intensity in the psychological capital-performance link: Evidence from the Middle East. (Target journal: Applied Psychology: An International Review). Chhajer R., Rose E. L. & Joseph, T. Role of self-efficacy, optimism and job engagement in positive change: Evidence from the Middle East. Manuscript submitted to Vikalpa: The Journal of Decision Makers (Revise and Resubmit). Chhajer R., Tandon, A., & Joseph, T. Positive Organizational Change: Practices, Mechanisms, and Impact. (Target journal: Journal of Applied Behavioral Science). Chhajer R. & Joseph, T. Role of social connectivity and job engagement in positive change: Evidence from the Middle East. (Target Journal: IIMB Management Review). Baker, W., Joseph, T., & Chhajer, R. (2018). UAE Exchange: The RACE for Positive Organizational change. (W73C38-PDF-ENG). Boston: Harvard Business Publishing. Chhajer R. & Joseph, T. (Dec 2017). Role of social connectivity and job engagement in positive change: Evidence from the Middle East. Presented at the Pan-IIM world management conference, Indian Institute of Management, Lucknow, India. Chhajer R. & Joseph, T. (Dec 2017). Positive Organizational Change: Practices, Mechanisms, and Impact. Presented at the Indian Academy of Management conference, Indian Institute of Management, Indore, India. Chhajer R., Joseph, T., & Rose E. L. (Dec 2016). Role of self-efficacy, optimism and job engagement in positive change: Evidence from the Middle East. (Nominated for the conference best paper award) Presented at the Pan-IIM world management conference, Indian Institute of Management, Ahmadabad, India. Chhajer R., Joseph, T., & Rose E. L. (Aug 2016). Linking psychological capital and performance: Mediating role of positive affect and work intensity. Presented at the Academy of Management Annual Meeting, Anaheim, USA. Joseph, T., & Chhajer R. (June 2015). Linking positive social capital and MNE performance: The mediating role of job engagement in a multi-cultural Middle East context. Presented at the Academy of International Business Annual Meeting, Bangalore, India. Joseph, T., Ramani, V., & Chhajer R. (Feb 2014). Developing positive psychological capital for job satisfaction and individual performance: Evidence from the Middle East. Paper presented at the AIB India-MENA Conference, Indian Institute of Management, Udaipur, India.